FOOD SNOB: Bad pancake gene? I used to think I had a "bad pancake gene" - like my Dad, my pancakes often used to be over-brown on the outside, while not quite fully cooked in the center. :( Lately, I have been working on overcoming my issues with pancakes, always setting the burner lower than I think I should, and exercising incredible patience before flipping. Seems to be working! 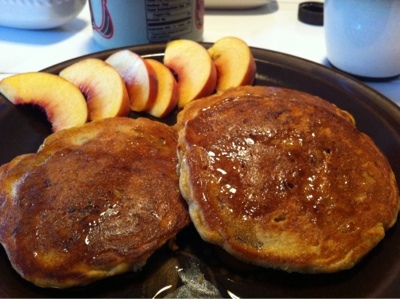 We had "Carrot Cake Pancakes" from Cooking Light for breakfast this morning. They were fantastic - hearty and filling, but not heavy. The only change I made to the original recipe was subbing whole-wheat pastry flour for the AP flour, which worked beautifully. Double-bonus? These pancakes used up several carrots that have been lingering in the produce drawer ... and incorporated some homemade buttermilk. Woo!